A denture is a removable plate, or dental plate, with one or multiple artificial teeth attached. While dentures are commonly called false teeth, the name dentures originates from the French word for tooth, dent, or the latin word dente. There are two main types. Partial dentures, referred to as dental partials, will have one or several teeth and are also called bridges whereas full dentures will replace all of the teeth for one or both jaws. When missing nearly all teeth, a full denture is the type that is needed. There are two types of full dentures, Immediate and Conventional. After removing any remaining teeth, your dentist may place an Immediate Denture that same day. While this denture may need to be remade once healing of your jaw is complete, with this type you won’t be without teeth. With a Conventional Denture, placement occurs only after healing of tissues which could be a few months. If you have teeth that can be saved, an Over-denture will be recommended as this better supports and stabilizes the denture while also preserving your jawbone. Dentures are suitable for anyone wanting to replace missing teeth, usually with the goal of resuming normal eating and speaking. With dentures cost being relatively inexpensive, they are affordable for most people. In addition, those concerned with their appearance are ideal candidates as this easy solution helps remedy the loss of facial volume and muscle sagging that occurs with tooth loss. As today’s dentures truly mimic natural teeth, patients no longer need to fear receiving artificial looking “choppers”. When properly fitted, a person can eat comfortably, dentures stay in place beautifully and appearance is restored. Dentures shouldn’t slip or come loose while eating or speaking, requiring messy denture adhesive to stay in place. If that is the case, schedule a dental office visit to prevent unnecessary embarrassment and discomfort. A short adjustment period where your tongue and cheek muscles adapt to keeping the dentures in place and you will be back to normal. Some patients experience temporary increase in saliva, slight soreness and irritation which will dissipate quickly. Treat your new smile just like you would your own teeth by rinsing and gently brushing them all over with a soft bristle toothbrush and gentle cleanser to eliminate debris and food. It is important to brush your gums to keep plaque at bay and circulation healthy in your tissues. Don’t forget the roof of your mouth, cheeks and tongue too! When not wearing your dentures place them in a container with water to prevent warping. 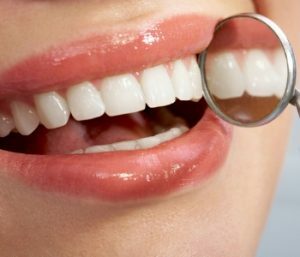 Lastly, be sure and find a dentist office you can trust to discuss your options for tooth loss replacement, to find the right solution for you.